1. How much does neutering cost around the UK? 5. Should I neuter my dog? 6. What age should a dog be neutered? 7. Does pet insurance cover neutering? 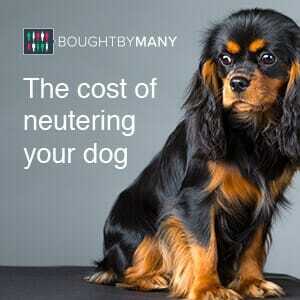 Home > News & Resources > How much does it cost to neuter a dog? it can cost between £110 to £230 to castrate a male dog and between £154 to £397 to spay female dog, based on our research. As a percentage, it's around 40% to 73% more expensive to neuter a female dog than a male. This is because the surgery is more intrusive for a female, with more involved. The cost of neutering your dog can vary depending on your dog’s gender, weight and your chosen vet practice. In males neutering is known as castration and it involves removing both testicles. In females it’s known as spaying, and it involves removing both the ovaries and the womb. How much does neutering cost around the UK? To find out how much it costs to neuter a dog, we spoke to seven vet practices across the UK. The research was carried out on the 19th March 2019. How much does it cost to have a dog neutered in Swansea? At Lakeside Vet Surgery in Swansea, Wales prices start from £128 to castrate a male dog weighing under 10kg. There are four price bands, based on your dog's weight, with the highest being £195 for dogs weighing over 40kg. To spay a female dog, prices start at £154 for dogs weighing under 10kg. Again there are four price bands, with prices increasing up to £278 for a dog weighing over 40kg. Crossing over to Vets4Pets in Hove, Sussex, it costs £110 to neuter a male dog weighing under 20kg, and £140 for dogs weighing over 20kg. For female dogs, a spay again is more expensive. Prices start at £155 for a dog weighing under 20kg, and increase up to £170 for a dog weighing over 20kg. This price doesn’t include any extras. We offer a Fixed for Life policy for pets under two years old. The price of cover will never increase, even if you claim. Heading towards the Bristol channel, it will cost £142.50 to castrate a male dog weighing under 10kg, with Zetland Vets, Bristol. There are five weight bands with Zetlands, with prices increasing to £197.50 for a male dog weighing over 50kg. For female dogs, a spay will cost £210 for a dog under 10kg. Prices go up to £285 for a dog weighing over 50kg. Again, there are five weight bands for females. Some vet practices offer keyhole surgery as a spaying option for female dogs. The surgery involves removing your dogs ovaries via a few small incisions, and the vet is guided using a small camera. It’s less intrusive which can mean a quicker recovery time for your pet. This option is available through Zetland Vets, and costs £167.50 on top of the Spay costs. Vets4pets also offer this, although not in every branch. How much does it cost to neuter a dog at PDSA? If you are on eligible benefits and live within the postcode catchment area of a PDSA clinic you may be able to get vet treatment at a reduced cost at the PDSA. The cost of castrating a male dog with the PDSA is £86. This can increase up to £113 if your dog's testes are inside his body, as more intrusive surgery will be required to remove them. The weight of your male dog does not affect the price of castration, with the PDSA. The cost of spaying a female dog under 10kg with the PDSA is £98. For a female dog over 10kg the cost is £113, and for a dog over 40kg the cost is £129. The cost of neutering does not vary by PDSA practice. This means that you can be assured that where ever you live in the UK, as long as you meet the PDSA criteria, you’ll pay the same price. Because the PDSA already offer a heavily discounted neutering vet service for your pet, they are unable to accept vouchers towards payment. Representing the London area in our research were Norbury vets near Streatham. They charge between £130 to £230 for a castration, and between £185 to £315 for a spay. They don’t segment pricing by weight, when providing information over the phone. Instead you’ll need to visit the vet, who will calculate a price at consultation. Remember prices will vary, depending on the vet practice you visit. Heading further north, towards Birmingham, we spoke to Brentknoll Vet Centre in Worcester. To castrate a dog under 10kg they charge £160, with prices increasing up to £230 for a dog weighing over 34kg. To spay a female dog, the prices start at £217.01 for a dog under 10kg, increasing up to £397.01 for dogs over 34kg. There are four price bands, depending on the weight of your dog. For a castration they charge £180 for a dog under 10kg, up to £220 for a dog weighing over 25kg. There are three price bands. For a spay they charge £210 for a dog under 10kg, up to £285 for a dog weighing over 50kg. There are four price bands for females. The price includes a pre-castration or spay check, the operation itself, and two post operative checks. ICR also offer a separate price list for keyhole surgery. The cheapest neuter with a private practice was Vets4Pets based in Hove. This is based on a medium size dog weighing between 10-20kg, when comparing the same weight band and prices, for most of the practices we spoke to. We didn’t include Norbury vets in this comparison, as we didn’t have a specific weight band related to pricing for the dogs. Nor did we include the PDSA as the service is heavily subsidised. Vets4Pets has multiple vets across the country, and for this reason, are likely to be able to keep their costs down, due to sourcing services and equipment more cheaply. More independent practices such as some of those in our list, are more likely to be expensive, simply because its harder for them to keep their costs down. Not all vet practices offer chemical castration for dogs, therefore you may need to travel to a vet further afield to get the procedure done. This can add to the costs. We asked a few of the practices if they offered the service, and they were not able to confirm or offer any pricing. The cost of neutering is usually based on the size of your dog, and gender, so if you own a smaller breed like Shih Tzu’s it shouldn’t cost you as much as a larger breed. For dogs under 10kg the cheapest neuter was with Vets4Pets Hove, priced at £110 for a male, and £155 for a female. They have only two price bands – under 20kg or over 20kg. Neutering your dog can have a range of positive benefits. It reduces the risk of more unwanted pups being introduced into the world. According to the PDSA animal and rehoming centres are full of unwanted animals. Unless you can find caring and committed ‘dog parent’s’ your new pups could end up in a rehoming centre, waiting for new owners. Nobody wants that for their pups. A male dog can be castrated between six to seven months, and depending on the breed, this can vary. Speak to your vet for clarification. A female dog can be spayed at around six months old, however this can differ if you have a larger dog. Your vet will be able to provide you with more information. Delaying your dogs spay un-necessarily could actually lead to more problems, such as increased risk of breast cancer after she’s had her third season. Pet insurance usually doesn't cover routine or preventative procedures such as neutering. However if the procedure is recommended by a vet, as essential treatment for another health problem, Bought By Many can consider it. Additionally should any complications arise during your dog's routine neuter, Bought By Many pet insurance will cover the cost of the vet treatment caused by the complication. Our Regular lifetime policy covers up to £7,000 of vet fees a year, and offers a zero excess option for pets under 9. The Dogs Trust run a scheme whereby if you are on eligible benefits and your dog is an eligible breed, you can quality for help towards the cost of vet care. You can visit the Dogs Trust website to find out more information. Find out the average cost of dog insurance, and what influences this in: What does dog insurance cost? Most vets and pet charities recommend getting your dog neutered. Although it's not cheap, it’s a responsible procedure to consider. We would suggest speaking to your vets before going ahead, so that you're fully aware of the benefits and risks. Learn how to house train your dog, to prevent toileting indoors. We've ranked lifetime pet insurance policies with a minimum of £7,000 of cover for vet fees.